A landing page contact form has to be attractive to the visitor. If the form is too long, contains too many boxes, or asks for too much information in exchange for too little, the chance of conversion is slim. However, a landing page contact form has to be useful to the marketer. 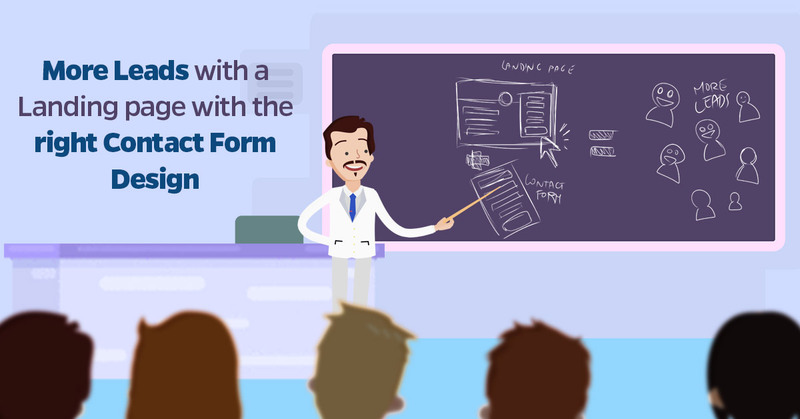 If the form is too brief, fails to include an effective call to action (CTA), or does not extract the information required to convert leads into a sale, then the form is of relatively little use. What is the purpose of your form? In Stage 1, visitors are at the very top of the sales funnel, where lead generation is the primary goal. At this stage, visitors are in the consideration stage. They think they might be looking for a product or service, and they’re interested in finding out more, but they’re far from actively considering a purchase. In Stage 2, visitors at the mid-point of the funnel are already fairly certain they wish to buy a particular product or service and are actively seeking further information. In Stage 3, visitors to the landing page contact form are actively ready to make a purchase and are looking to get in touch in order to do just that. The reason that these stages are important is because they directly influence the goal of your landing page contact form. If visitors are at Stage 1, the primary goal is securing interest and encouraging the visitor to find out more about a product or service they are – at present – only considering. If visitors are at Stage 2, the primary goal is to convince visitors that a product or service they already know they need is best supplied by you. If visitors are at Stage 3, the primary goal is to secure a sale, as the visitor is ready to buy. When you know what stage of visitors you are targeting with your landing page form design, you can move on to the next consideration. How many fields should you use on a landing page contact form? Conventional wisdom suggests that the fewer fields on a landing page contact form, the more likely it is that a visitor will actually complete the form. There is some truth to this, too, so it’s well worth keeping brevity in mind when considering landing page form design – but it’s worth remembering that your landing page contact form has to meet your needs, too. For example, if you have a visitor who is at Stage 3, then a very brief contact form is of little use to you or the consumer. A Stage 3 visitor isn’t particularly interested in finding out more information or obtaining a free sample; they’re ready to buy. On the other hand, a Stage 1 visitor isn’t going to sit and fill out multiple fields in order to obtain more information about a product or service they’re not yet particularly interested in. Stage 1 visitors require short forms, with as few fields as possible. If confronted with a landing page contact form that requires they divulge a huge amount of – sometimes personal – information, they’ll walk away. For these visitors, all your landing page form design needs to include enough information to contact the visitor again in future, such as their name and email address. Stage 2 visitors are usually willing to tolerate more fields, as they have already decided that they are in need of a product or service like yours. Their interest is already piqued, and they’re essentially looking for more information – and, as a result, they’re willing to provide more information themselves. However, they will only provide it if doing so benefits them; for example, if they are going to receive an ebook or sales brochure that will provide useful information that can influence or further inform their purchasing decision. Stage 3 visitors are willing to tolerate even longer forms still. 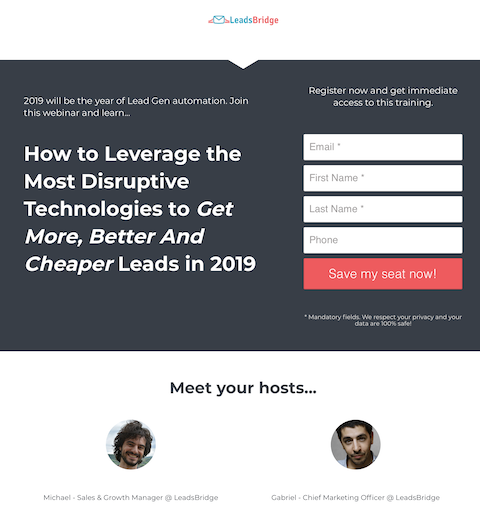 They have already decided that they are going to make a purchase, so you can use your landing page contact form to ask for information that helps decide if their lead is worth your time. For example, if you were selling high-end cars, asking for income details would be an appropriate way to qualify a Stage 3 lead. Which fields should be ‘required’? One of the fundamental elements of landing page form design is the decision over which fields will be ‘required’ – i.e. which fields does the visitor have to complete in order to submit the form successfully. It’s at this point you have to make a decision regarding which information is useful to your goals; what do you actually need to convert the visitor, depending on the stage they are at? For Stage 1 visitors, you don’t need very much at all – all you’re looking to do is obtain basic information that you can use to contact that visitor again at a later date. As a result, it’s usually best to keep things simple, and just make two fields – the name and email address – “required”. For Stage 2 visitors, you may need a little more information, but you still don’t need too much. After all, at this stage you’re largely looking to provide more information on your product or service to an already-interested visitor; you may want to contact them again, but do you really need more than their name and email address to do that? If not, then stick with just the name and email address fields as “required”. For Stage 3 visitors, however, you’re qualifying the lead, so you do need more information. In this case, it’s best to focus on the information that truly helps to qualify your lead. Returning to the example above of selling luxury cars, the visitor’s income would genuinely help you to qualify the lead, so it could be set to “required”. However, you should still be cautious with your landing page form design even for Stage 3 users; if you set a field to “required”, and the visitor doesn’t wish to provide that information, you could lose a hugely promising lead. So you’ll need to weigh up what’s more important to you; do you only have time to pursue qualified leads? If so, then you could set additional fields to “required”. However, if a lead is better than nothing, then you may well be best just opting for basic contact information again. When you have considered the factors above, you’ll also need to ensure your landing page form design ensures visitors aware of the fact that only some fields are “required”. If confronted with a long form that is unclear on which fields are “required” and which are “optional”, many visitors will assume all fields are “required”, and just walk away. Should you use multi-step landing page contact forms? Multi-step forms involve the visitor submitting information across three different pages. The biggest benefit of multi-step landing page contact forms is that they keep the information relatively contained, allowing you to include a number of fields without overwhelming the visitor. Of course, if using a multi-step landing page form, you will need to consider whether such a form is necessary for the stage of visitor you are targeting. As a general rule, multi-step landing page form design is best used when targeting visitors who expect to be at Stage 3 of the sales funnel and, in some cases, Stage 2. As we’ve discussed, these visitors are actively seeking your product or service specifically; this means they are more willing to submit more information; and thus they can benefit from a cleaner multi-step landing page rather than a long, imposing list of fields on a single page. If your visitors will be at Stage 2 or Stage 3, you will need to to make clear that there are multiple pages to complete on your landing page contact form. You can do this by simply adding “Step One / Two / Three” to each page, with Step Three containing your most impactful CTA. What type of CTA should you include on your form? The text should be short – long CTA buttons can be off-putting, so try to use as few words as possible while still making your point. With the above information in mind, you should be able to ensure that your landing page contact forms can produce favorable results. If the above landing page contact forms tips are adhered to, you can use a landing page to build your brand, grow email list,and synchronise all the leads that you collect through our Landing Leads feature. Check it out!